Step 1: Download the Agora Signaling SDK. Download the Agora Signaling SDK. Step 2: Unpack the downloaded SDK and save the files in the libs folder to the corresponding folder of your project. The library provided by the Agora Signaling SDK is a FAT image,which includes versions for the 32/64-bit emulator and the 32/64-bit real device. Step 3: Add the required framework. 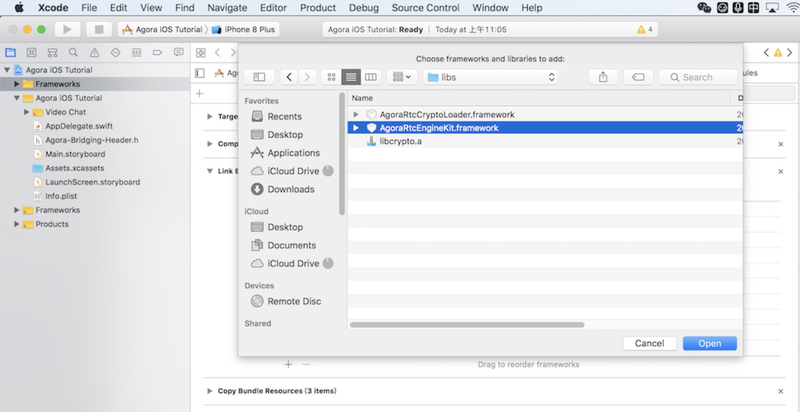 In Xcode, set the search path of the framework to the Agora SDK lib folder. Click Building Phases to add the required library. Click Link Binary with Libraries > + to add the following libraries. AgoraSigKit.framework is in the libs folder of your project. Click + > Add Other… to enter the project folder to add the libraries. Step 5: Get an App ID and an App Certificate. Put your AppID and App Certificate into “Agora-Signaling-Tutorial-macOS-Swift/Agora-Signaling-Tutorial/MainPage/KeyCenter.swift”. let AppId: String = "YOUR APPID"
let AppCertificate: String = "YOUR CERTIFICATE"
Step 6: Generate a token. Step 7: Fill in the developer signature. Use XCode to open Agora-Signaling-Tutorial.xcodeproj and fill in a valid developer signature.